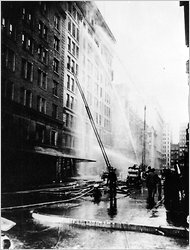 March 25 is the 100th anniversary of the Triangle Shirtwaist Factory Fire in New York City. 146 people, most of them women and some as young as 15, died in the fire. Young women garment workers, unable to open the fire doors because they were locked and beyond the reach of the fire department’s ladders, jumped to their deaths from the upper stories of the factory to avoid the fire. This horrifying scene caused a public outcry over the serious health and safety problems facing factory workers and paved the way for legislation aimed at protecting them. Rose Friedman, the last survivor of the fire, died in 2001 at the age of 107. The names of the last six victims were recently identified through the work of Michael Hirsch, an independent researcher. Commemoration of the fire and its victims has taken on many forms this year, and include an annual project by Ruth Sergel and a group of volunteers who visit each building where one of the victims lived and chalk a name, age and cause of death. The HBO documentary Triangle: Remembering the Fire premiered on March 21, and the HBO website includes many archival photographs. A calendar of events is compiled by the Remember the Triangle Coalition. The NY Times’ Times Topics includes archival articles and photographs, and the Library of Congress has a chronology and sampling of newspaper articles in Topics in Chronicling America – Triangle Shirtwaist Factory Fire. was sponsored by Senator Kirsten Gillibrand and passed by the Senate on March 17, 2011. The Triangle Shirtwaist Factory fire, March 25, 1911: A Memorial Compilation and Testament to the 146 Victims, Their Families and Those Heroic Immigrants Whose Labor and Sacrifice Made America Great (Birnbaum F128.5 .T785 2007). Richard A. Greenwald, The Triangle Fire, the Protocols of Peace, and Industrial Democracy in Progressive Era New York (Mortola HD6976.C62 U64 2005). Leon Stein, The Triangle Fire (Mortola & Birnbaum F128.5 .S83). Dave Von Drehle, Triangle: The Fire That Changed America (Law Library F128.5 .V688 2003).